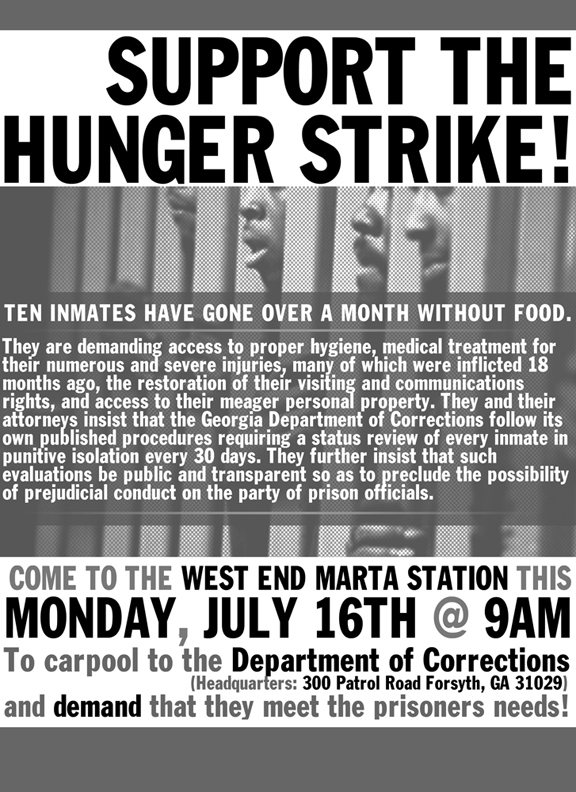 Georgia prison hunger strikers facing death. Nine prisoners face death on a hunger strike for human rights that began June 11 at Georgia’s massive Diagnostic and Classification prison, where Troy Davis was murdered last year and where men are tortured in solitary confinement. “It has been 33 days since these men have eaten. We must move swiftly or people are going to start dying,” writes Delma Jackson, wife of the inmate who leads the strike, Miguel Jackson. 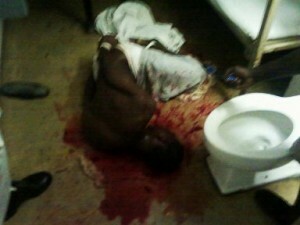 Miguel Jackson, GA. prisoner beaten with hammers by guards, 12/31/10. Photo courtesy Final Call. Families and an attorney for the prisoners, however, “insist that the nine hunger strikers remain resolved and continue to insist on administrative review of their status, adequate medical care, and access to mail and visitation privileges with their families and attorneys which have been arbitrarily denied them,” reports San Francisco Bay View News, based on the story by Bruce A. Dixon, managing editor at Black Agenda Report where this story first appeared. Dixon is a member of the state committee of the Georgia Green Party and is heard on Black Agenda Radio Commentaries. Georgia Classification and Diagnostic Prison, location of hunger strike. Troy Davis, who received world-wide support, was executed here. 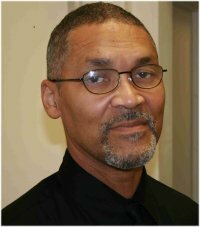 “Prison officials are surprised at the level of outside support the inmates enjoy despite a virtual news whiteout,” states Bruce Dixon, editor of The Black Agenda Report. “Miguel and other inmates at Georgia Diagnostics have been denied access to proper hygiene [and] medical treatment for their numerous and severe injuries, many of which were inflicted 18 months ago,” wrote Delma Jackson in a Change.org petition. Jackson’s family alleges that he was beaten by prison guards at Smith State Prison in December 2010, transferred in 2011 to the Georgia Classification & Diagnostic Prison where he has been kept in solitary confinement for the past 18 months. Protest outside Detroit’s Mound Rd. prison on Dec. 14, 2010, to support striking Georgia prisoners, nine of whom are now on hunger strike facing death. The Department of Corrections denied those allegations in a statement to the AJC. 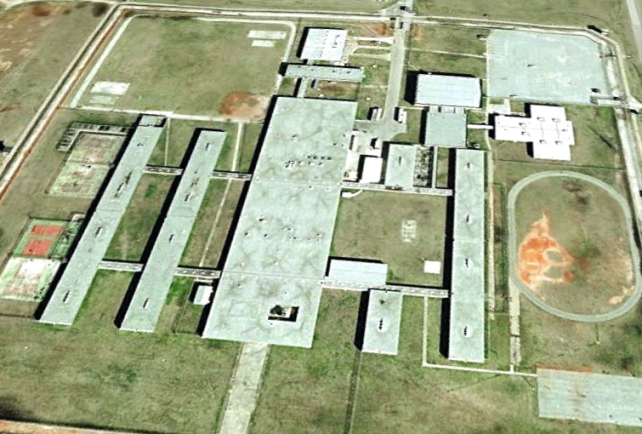 “[The Georgia Bureau of Investigation] investigated the claim filed by inmate Miguel Jackson regarding the 2010 Smith State Prison incident and found no validity to the inmate’s complaint,” stated Dabney Weems, a public relations official. According to the ACJ,the department also said Jackson has not been in solitary confinement. Bruce Dixon, editor Black Agenda Report. Many of the men now on hunger strike were involved in a hunger strike launched in December 2010. “Unfortunately the peaceful demonstration was cut short by the brutal beating of inmate Miguel Jackson and others who were allegedly targeted for participating in the protest,” reported CBS Atlanta on Monday. Monday, Jackson said he still suffers splitting migraines as a result of the attack. The strike gained national attention Monday, July 9 after approximately 30 people gathered at Georgia’s state capitol to visit the governor’s office, where they left support letters for the hunger strikers. A Solidarity Rally was to be held Monday at the Georgia Department of Corrections headquarters, 300 Patrol Rd., Forsyth, Ga.
Delma Jackson heads the Prodigal Child Project Atlanta. “Whether or not the hunger strike lasts much longer, the nine prisoners involved have already demonstrated their unshakable resolve and deserve your continued concern and support – and your calls, which are still needed,” states Ratcliff. Warden, Georgia Diagnostic and Classification Prison, phone (770) 504-2000, fax (770) 504-2006. Commissioner Brian Owens, Georgia Department of Corrections; ask for his administrative assistant, Peggy Chapman, phone (478) 992-5258. Georgia Gov. Nathan Deal, phone (404) 656-1776, fax (404) 657-7332; you can also send the governor a letter online by clicking here. 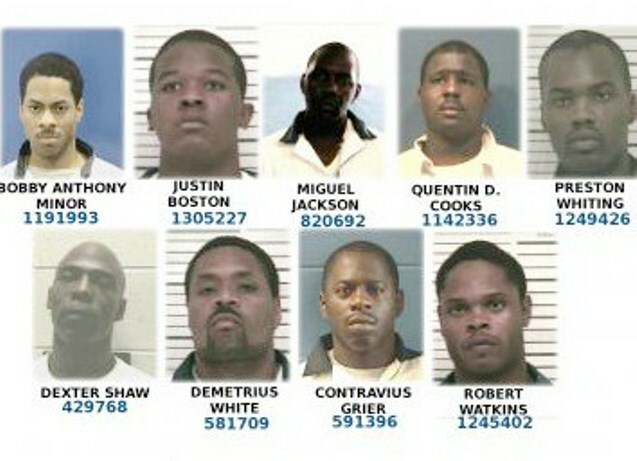 Georgia Department of Corrections Ombudsman, phone (478) 992-5367 or (478) 992-5358, email Ombudsman@dcor.state.ga.us. Please add a cc to the email, info@georgiagreenparty.org. Freedom Archives 522 Valencia Street San Francisco, CA 94110 415 863-9977 www.freedomarchives.org. You very obviously have zero experience with the prison system. You should keep these ridiculous opinions you post as factual off the internet. Execution is not murder, it is the end to their life they deserve. Please educate yourself much deeper before you make anyone think that this type of post has any validity.